The Brush Bar is used for after washing brushes. It is a great new device inside you open it up and it little pull out holders. These holders are for the brush handles to go into while the brushes are drying. There are a number of ways you can dry brushes. Just like in this photo, off of a large surface on the side. or POP open the lid at the edge of the Brush Bar, where you see a thumb indentation.FLIP The Brush Bar upside down so that the prongs flip our of the bar. 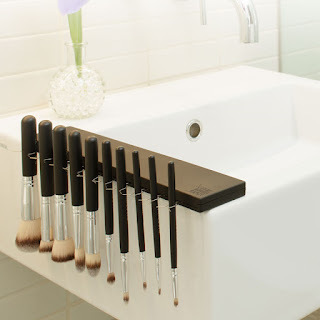 SNAP The Brush Bar shut and place at the edge of your vanity, desk, sink or counter. PUSH your brush into the prongs with bristles pointed down ward for drying wet brushes or storing and holding as you would use to to apply makeup. It even has its own velvetine carrying case. 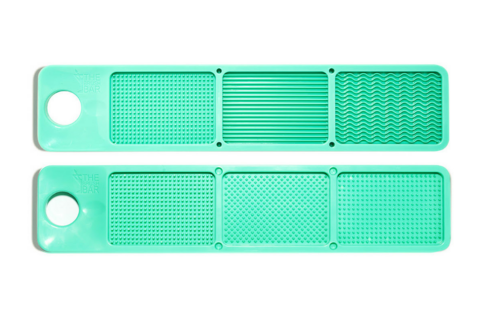 The Brush Board is the first ever makeup brush exfoliator. It is made of firm material for maximum cleaning power. Water-pooling sections that cup water for lasting lather are available as is 6 different textures to scrub between and around bristles. For the most effective clean, apply a brush cleaner and a splash of water before gently swirling brushes back and forth along the board's surface. It can easily be cleaned by running it under warm water and laying it out to dry. Keep hand easily cleaned as you wash your brushes. It does a very good job of cleansing brushes. Other companies have flowers and things that do the job but I like this. It is the perfect thing. Then you dry off your brush and hang it on the drying board Brush Bar. These really do make the perfect applications for their jobs. They also have Brush Bubbly that sells for $18.00. Otherwise use baby shampoo. use code MAKEUPJUNKIE15 to get 15% off your entire purchase at www.getbrushbar.com!!!! You can get these at www.getbrushbar.com, www.amazon.com and sometimes www.ipsy.com. Like Brush Bar on Facebook: https://www.facebook.com/getbrushbar and on Instagram: https://www.instagram.com/getbrushbar/.